Joy Creek Photo Archive (c) all rights reserved Small. 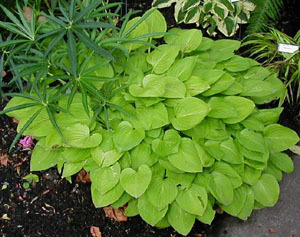 Hosta 'Golden Scepter' (Savory) produces good substanced golden, lance shaped leaves that are held upright on long petioles. Large dusky lavender flowers with dark veining and streaks of white.